In March, Lufthansa Group airlines increase capacity utilization to a new record level despite significantly increased services. In March 2018, the airlines of the Lufthansa Group welcomed around 11.1 million passengers. This shows an increase of 15.7% compared to the previous year’s month. The available seat kilometers were up 9% over the previous year, at the same time, sales increased by 14.5%. The seat load factor increased by 3.9 percentage points compared to March 2017 to 81.2%. This is a new record which is partly also connected with the postponement of the Easter holidays from April to March. Capacity utilization also reached an all-time high of 77.8 percent in the first quarter of 2018. Around 28.6 million passengers flew with the airlines of the Lufthansa Group in the first three months of this year. The currency adjusted yield indication remained stable in March compared to previous year. Cargo capacity increased four percent year-on-year, while cargo sales were up 0.4% in revenue tonne-kilometer terms. As a result, the Cargo load factor showed a corresponding reduction, decreasing 2.6 percentage points in the month to 71.3%. 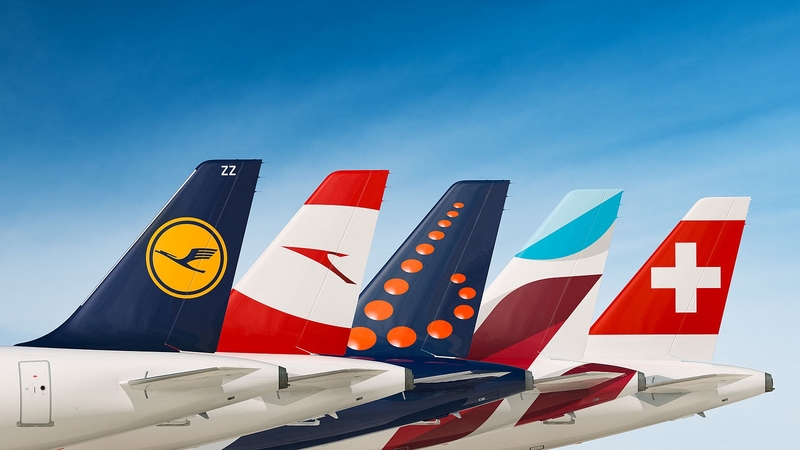 The Network Airlines Lufthansa German Airlines, SWISS and Austrian Airlines carried 8.2 million passengers in March, ten percent more than in the prior-year period. Compared to the previous year, the available seat kilometers increased by 5.3% in March. The sales volume was up 10.4% over the same period, increasing seat load factor by 3.7 percentage points to 81.1%. Lufthansa German Airlines transported 5.7 million passengers in March, a 10.2% increase compared to the same month last year. A 4.8% increase in seat kilometers in March corresponds to a 9.2% increase in sales. Furthermore, the seat load factor was 81.5%, therefore 3.3 percentage points above the prior-year’s level. Lufthansa is growing above all at its Munich location. In March, 12.6% more passengers took off from the Bavarian 5-star hub than a year earlier. This means that growth in Munich was a third higher than in Frankfurt, where 9.2% more passengers flew than in the same month last year. The Lufthansa Group’s Point-to-Point Airlines – Eurowings (including Germanwings) and Brussels Airlines – carried around 2.9 million passengers in March. Among this total, 2.7 million passengers were on short-haul flights and 260,000 flew long-haul. This amounts to an increase of 35.4% in comparison to the previous year. March capacity was 30.6% above its prior-year level, while its sales volume was up 39.1%, resulting in an increased seat load factor by five percentage points of 81.3%. On short-haul services the Point-to-Point Airlines raised capacity 34.8% and increased sales volume by 48.4%, resulting in a 7.3 percentage points increase in seat load factor of 79.3%, compared to March 2017. The seat load factor for the long-haul services increased by 1.6 percentage points to 85% during the same period, following a 23.5% increase in capacity and a 25.8% rise in sales volume, compared to the previous year. Αναρτήθηκε από geop στις 11:18 π.μ.